Indo-Iranian languages are spoken by more than 1.5 billion people. The languages with the most speakers are a part of the Indo-Aryan group: Hindustani (Urdu/Hindi), (~590 million), Bengali (205 million), Punjabi (100 million), Marathi (75 million), Gujarati (50 million), Bhojpuri (40 million), Awadhi (40 million), Maithili (35 million), Odia (35 million), Marwari (30 million), Sindhi (25 million), Assamese (24 million), Rajasthani (20 million), Chhattisgarhi (18 million), Sinhala (19 million), Nepali (17 million), Bishnupuriya (12 million) and Rangpuri (15 million). Among the Iranian branch, major languages are Persian (60 million), Pashto (ca. 50 million), Kurdish (35 million), and Balochi (8 million). There are also many smaller languages. The common proto-language of the Indo-Iranian languages is Proto-Indo-Iranian, which has been reconstructed. The oldest attested Indo-Iranian languages are Vedic Sanskrit (ancient Indo-Aryan), Older and Younger Avestan and Old Persian (ancient Iranian languages). A few words from another Indo-Aryan language (see Indo-Aryan superstrate in Mitanni) are attested in documents from the ancient Mitanni and Hittite kingdoms in the Near East. ^ Hammarström, Harald; Forkel, Robert; Haspelmath, Martin, eds. (2017). "Indo-Iranian". Glottolog 3.0. Jena, Germany: Max Planck Institute for the Science of Human History. ^ D. D. Mahulkar (1990). Pre-Pāṇinian Linguistic Studies. Northern Book Centre. ISBN 978-81-85119-88-5. ^ Annarita Puglielli; Mara Frascarelli (2011). Linguistic Analysis: From Data to Theory. Walter de Gruyter. ISBN 978-3-11-022250-0. ^ Numeral Types and Changes Worldwide, by Jadranka (EDT) Gvozdanovic, Language Arts & Disciplines,1999, Page 221. Books.google.com. Retrieved 2 January 2013. : "The usage of 'Aryan languages' is not to be equated with Indo-Aryan languages, rather Indo-Iranic languages of which Indo-Aryan is a subgrouping." ^ Bashir, Elena (2007). Jain, Danesh; Cardona, George (eds.). The Indo-Aryan languages. p. 905. ISBN 978-0415772945. 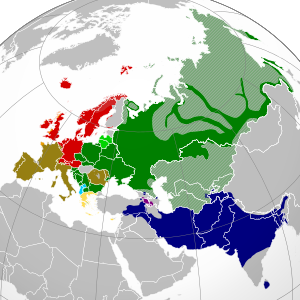 'Dardic' is a geographic cover term for those Northwest Indo-Aryan languages which [..] developed new characteristics different from the IA languages of the Indo-Gangetic plain. Although the Dardic and Nuristani (previously 'Kafiri') languages were formerly grouped together, Morgenstierne (1965) has established that the Dardic languages are Indo-Aryan, and that the Nuristani languages constitute a separate subgroup of Indo-Iranian. ^ Edwards, Viv. "Urdu Today". BBC. ^ Thompson, Irene. "Bengali". AboutWorldLanguages. Retrieved 29 March 2013. "Contact and change in the diversification of the Indo-Iranic languages" (PDF).